Q2. The Cisco IOS firewall IDS is a(n) . B. package that runs on Windows 2000. C. software-based feature set for 500 series routers. D. system that runs on the PIX firewall. E. software-based feature set developed for mid-range to high-end routers. Q3. How does the Cisco IOS firewall IDS identify potential attacks? A. It scans the network. B. It matches packets against signatures. C. It matches audit rules. D. It scans packet headers. E. It scans for potential viruses. Q4. How does the Cisco IOS firewall IDS operate with CBAC? B. They can run in concert or be applied to different interfaces. C. It must be applied to different interfaces. D. They must be applied to the same interface. Q5. What configuration mode must you be in to configure “notification types”? Q6. What are you configuring with the ip audit notify command? Q7. What is the default port for the POP? Q8. Why should you define a “protected network”? A. So you know who is attacking your network. B. To protect yourself from disgruntled employees. C. The signatures only apply to the protected network. D. It is a requirement to make the IDS function work. Q9. What is the difference between an atomic signature and a compound signature? A. Atomic signatures are really bad. B. Compound signatures require more memory. C. Atomic signatures only see oversized packets. D. Atomic signatures can overload your router. Q10. What command is used to reset statistics? Q11. How are signatures listed in the Cisco IOS firewall? Q12. 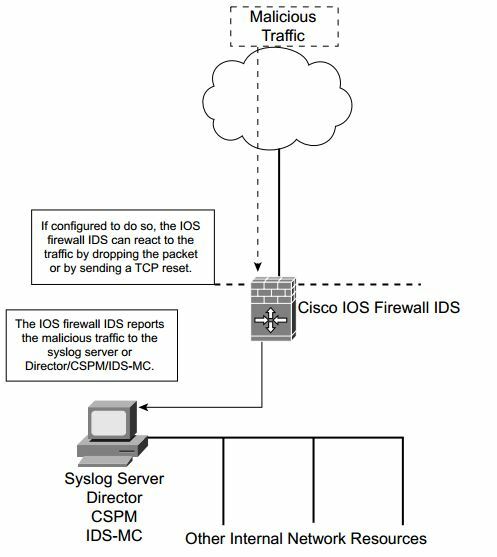 How does the Cisco IOS firewall IDS operate? Q13. What are the three actions that are performed by the IOS firewall IDS when malicious traffic is discovered? Q14. Why would you want to disable some signatures? Q16. What are the four steps to configuring the firewall IDS? Answer: Initialize the Cisco IOS firewall IDS on the router, configure attack signatures, create and apply audit rules, and add the Cisco IOS firewall IDS to the centralized management. Q17. What must match for POP to work? Answer: Both the IDS and manager must have the same organization ID. Q18. In the command ip audit po remote . . . timeout, what timeout are you configuring? Q19. When you configure ip audit po protected, are you configuring a subnet or address range? Q20. Why should you configure a maximum queue for alarms? Q21. Which signatures create a greater load on the router performance? Q22. How do you exclude a signature? Answer: Use the ip audit signature command. Q23. What is the first step to creating an audit rule? Answer: Configure the default actions.